As a corollary to modernization, the life has become faster these days, traffic has become thicker and thereby increasing the incidence of trauma. The colossal role of trauma centers to curtail the morbidity of trauma patients can be easily assumed. The establishment of JPNATC (a Level I Apex Trauma centre) is an audacious step in this regard. Department of Trauma Surgery is one of the main pillars on which JPNATC stands. Under the proficient guidance of Prof. M.C. Misra, Chief of Trauma Centre, the department of Surgery in JPNATC, has attained a reputable position in the society because of proficiency and continuous endeavor of the consultants for the best in every aspect and the commitment of the residents. The Department of Trauma Surgery bridges the critical gap between the resuscitation to definitive management and beyond at the Apex Trauma Center, AIIMS. Keeping itself truthful to its cause it provides the continuity of care to seriously injured polytrauma patients while also providing specialized definitive care to them. It runs in close cooperation with other clinical departments at trauma center i.e. Emergency Department, Neuro-trauma, Orthopedic trauma and Trauma Critical Care providing a holistic care to the multiply injured patients. The trauma surgery unit provides support to the specialty departments of neuro-trauma and orthopedic trauma as and when required. The Department has six faculty members and provides the leadership to the Trauma Center through Professor M C Misra who is also the chief of the Center. The department boasts of three full time core trauma surgeons and two plastic and maxillofacial surgeons. The trauma surgery unit has 10 senior residents and 2-3 junior residents from General surgery and Dental surgery who rotate for 1 year and 4 months respectively at the Unit. Poly trauma patients with predominant trauma surgeon role. All patients being taken Care by the Trauma Surgery Department are dealt with equal expertise to the contentment of the patients, relatives and the treating surgeons as well. Surgery wards are well- equipped with all the armamentarium that an ideal trauma surgery unit should have. All beds of the ward are equipped with centralized Oxygen and suction devices. Every bed can be isolated with the help of wall mounted curtains during basic surgical procedures. The General ICU is on the second floor. There are 16 beds in the ICU (including two Isolation rooms). 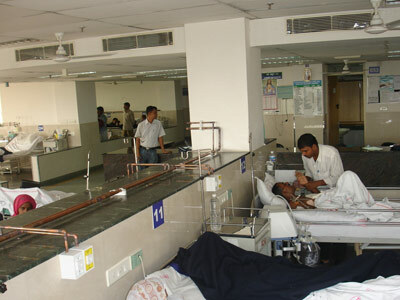 The ICU is supervised by anesthetists, but one senior resident is appointed from the Surgery department to look after the patients admitted in ICU. JPNATC has state-of-the-art OT, equipped with all the modern amenities besides general surgical instruments such as LED lights, ultrasonic scalpel, high end microscope skin graft preserving fridge, plasma sterilizer, all laparoscopic instruments, and state of the art surgical diathermy. We run three days of follow-up OPD. The department of surgery, JPNATC receives direct patients as well as patients being referred from all parts of the country. All kinds of trauma, (including abdominal, thoracic, thoraco-abdominal, vascular, maxillo-facial) etc are dealt with equal expertise to the contentment of the patients, relatives and the treating surgeons as well. The Trauma Surgery Unit is actively involved in trauma education and researches both in-house and for other professionals working in trauma surgery through various seminars, symposia and conferences. The Trauma Surgery Unit has had visitors as guest faculty from leading trauma centers of the world, including R Adams Cowley Shock Trauma Center, USA, Regional Trauma Center, Tampa General Hospital, USA, Teaching Center for Trauma Emergency and MCS, Rambam Health Care Campus, Haifa, Israel. The Department of Trauma Surgery envisages establishment of an academic unit of trauma and surgical critical care which will initiate post PG Courses in Trauma Surgery and Surgical Critical Care. The post PG Courses will depend upon the need of the society to train more general surgeons/ orthopedicians into the finer aspects of Trauma Surgery and critical care. These courses will be either formal M.Ch. courses or in the form of long term 1-2 year training programs for in-service general surgeons sponsored by central/state governments. The trauma surgery department at the Apex Trauma Center along with the other departments have already been involved in short term training programs for doctors being sponsored from Armed forces, overseas medical graduates, Central and state governments. In future it will continue to train doctors/ medical officers/ surgeons interested in various aspects of trauma care.